MoMA might not be the first museum you think of visiting with your children but think again—MoMA staff have put together an amazing array of resources to make visiting the museum with your kids a pleasant and rewarding experience. 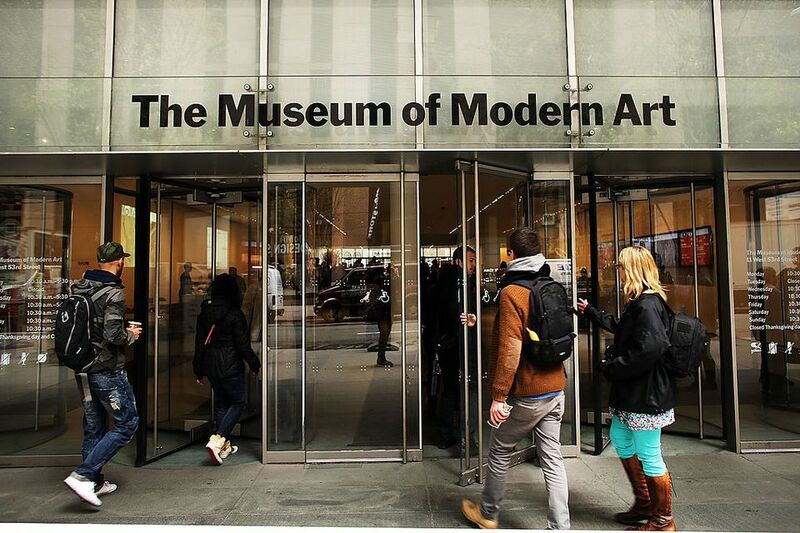 The MoMA is open daily, except Thanksgiving Day and Christmas Day. Admission is always free for visitors 16 and under—Avoid the free admission time at the MoMA with kids because it tends to be very crowded and it's difficult to keep track of little ones or really enjoy the art. It's ideal to be at the museum when it first opens and galleries are at their quietest. Strollers are allowed in the galleries. Sketching is allowed in the galleries with pencils only—and parents are asked to hold pencils for children when moving through the galleries. Before you go, find out if there are particular artists/works of art that your kids have been studying in school or would like to see. A visit to the sculpture garden is a great way to break up a visit to the MoMA. Kids can enjoy an ice cream or cookies and blow off some steam. Sometimes, there are plenty of kids playing hide and seek and exploring the area. Parents can sit back and have a wine or beer and recharge before returning to the galleries. An audio tour is a great tool for exploring the museum—The MoMA does a fantastic job of putting together an engaging, exciting audio tour that kids love. It's also practically a treasure hunt for the kids to look around the galleries for the pieces that have accompanying children's audio tour content. Looking At Art With Your Kids—Valuable advice and suggestions for engaging your children with art. Stop by the 2nd Floor Education and Family Information Desk for advice, as well as to pick up the free Family Activity Guides, Family Visit brochures, and the Family Programs schedule. On a recent visit, we also got a Passport which the kids could get stamped on every floor of the museum. They loved it. MoMA Art Lab, located in the educational building, offers hands-on, interactive activities for all museum visitors and is open whenever the museum is open. The museum's gift shop has a lot of great souvenirs—it's a great place to buy gifts for people. Get the MoMA App—it makes it easy to find the particular piece of art that you're looking for and includes access to the audio tour. Modern Kids—This audio tour is fun and engaging and guides kids (and adults!) through exploring many highlights of MoMA's collection. MoMA Teen Audio—This dynamic audio guide was created for teens, by teens and promises to keep teens interested. MoMA offers a variety of programs for kids as young as four and their families. Admission is free for up to two adults and three children per group. The "A Closer Look For Kids" program is a free and easy way to spend time at the museum with your kids without the stress of how to engage them or whether they might be bothering other museum visitors.